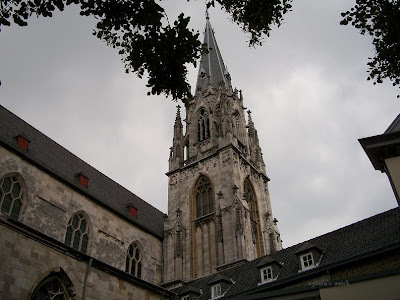 The tower of the magnificent Aachener Dom (cathedral) pointing at the sky. Aachen is situated just across the German border only 10 minutes from where I live. I'll show some more pictures next week on MyWorld. Beautiful cathedral and beautiful against the sky -- even if the skies are a little grumpy! Terrific capture as always, Jossie! Happy SWF! Hope you have a wonderful weekend! The tower of the beautiful cathedral against the sky is magnificent. What a beautiful structure, have enjoyed looking at your pictures. Mooie foto van de Aachener Dom Jossie. Fijn weekend! Very beautiful~! What a wonderful church! Jammer dat de lucht zo grijs was, maar de toren van de Dom staat er mooi scherp en spits op. A magnificient tower and very beautiful capture.